Mars is the fourth planet in the solar system, located between Earth and Jupiter. It is known as the “Red Planet” due to its bloody color. This color is the result of a layer of iron-rich dust. The distance between Mars and the Sun is much greater than Earth’s—at its closest, the planet is 128 million miles from the Sun, and at its farthest, the distance is 154 million miles. Due to this distance, a Martian year lasts 687 Earth days. 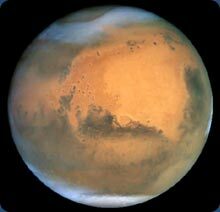 A Martian day, however, is similar to an Earth day, lasting just over 24 hours. Mars has two moons, Phobos and Deimos. These are two of the smallest moons in the solar system. They are asteroids that once came close enough to Mars to be captured by the planet’s gravity and have been circling it ever since. Mars has a central core, made of iron, surrounded by a thick layer of rock. A very thin layer of air covers the planet. This atmosphere is thinner than Earths, but causes Mars to have weather, including clouds and dust storms.